A ding-type porcelain bowl, the thinly potted shallow-rounded sides rising from a low foot. The interior of the bowl is mould-impressed with a lotus pond to the centre in which large lotus leaves and flowers are visible. The central motif is surrounded by a wide band of two phoenixes in flight amid peony and prunus flowers. The decoration is contained within an outer band of continuous key-fret pattern. 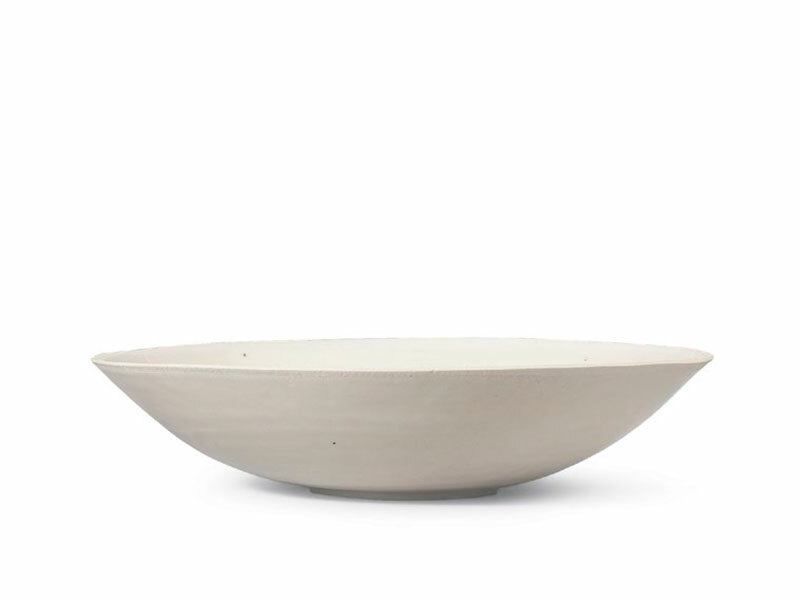 The bowl is almost completely covered in a brilliant white glaze, leaving just the foot rim and the outer rim uncovered, showing the very fine white body of the clay. The motif of a phoenix in flight, a popular decorative device during the Song and subsequent Yuan dynasties, symbolises marriage, suggesting that this delicately potted and crisply moulded porcelain bowl was intended as a wedding gift. Phoenixes rising in flight with their legs tucked up into their bodies and tail segmented into five barbed filaments, were depicted by the Northern Song period (960 – 1127 CE). By the Southern Song period (1127 – 1279 CE), the phoenixes were usually paired. The present bowl was most probably made at Jingdezhen (also known as Raozhou) in Jiangxi province, in imitation of Ding wares which were produced in the Ding kilns situated in present-day Quyang county in Hebei province, south-west of Beijing. The high level of craftsmanship and materials used in creating such wares is evident at the first glance and when held. The unglazed rims of these bowls are a result of the firing process, which required bowls such as this to be fired upside down in order to prevent warping, making it necessary to wipe the glaze from the rim. 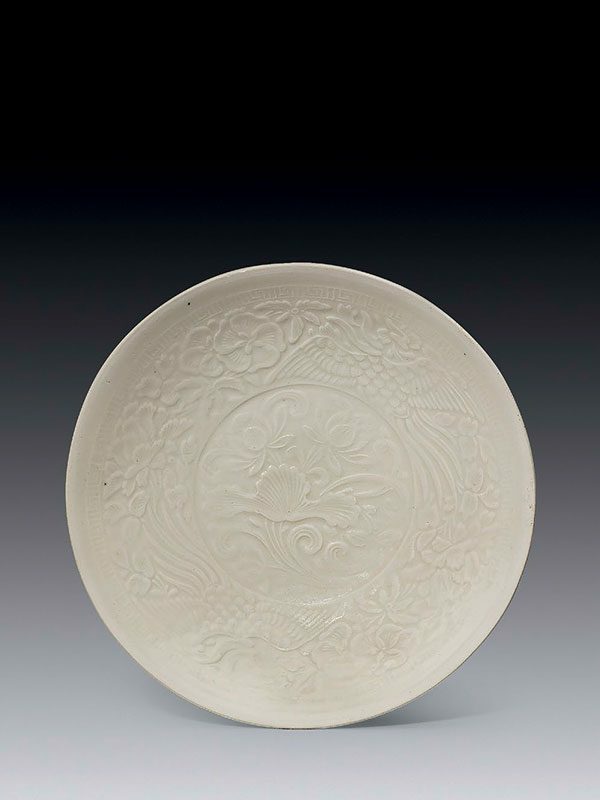 A closely related Southern Song Ding-type shallow bowl moulded with phoenixes and flowers, covered in a similar ivory white glaze and produced in Raozhou, is in the Kwan collection. Two further comparable examples with a similar decoration but covered in a bluish white qingbai glaze are in the collection of the Palace Museum, Beijing.